The route to the summit had been covered by recent snowfall. 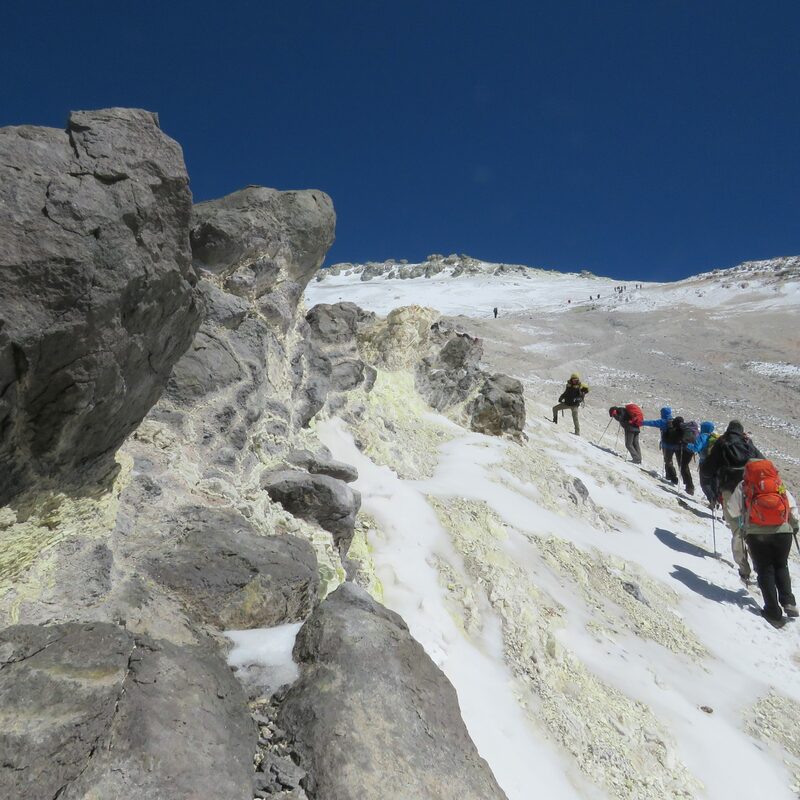 The path was impossible to find, no-one had climbed Mt Damavand for at least a week. Later in the summer every year, hundreds of Iranians climb the same route each day. But that morning at the very start of the season we had this giant volcano to ourselves. The mighty peak that is Mt Damavand is the highest mountain in Iran and also the highest volcano in Asia. It is nearly perfectly conical, rising high from the deep valleys that surround it. It soars to at least 5,610m, a comparable height to Elbrus, but the exact altitude of the summit is hard to be sure of nearly all sources give different values. On our summit day, we had nearly perfect weather. A few light clouds came and went but the wind was soft and we only got a flurry of snow for 3 minutes. The sun was bright on the fresh white snow slopes as we broke trail up the ridges. The higher we climbed the more of Iran was revealed to us. The deserts stretched off into the distance to the south with the Alborz Range stretching off to the east and west below us. My Iranian climbing partner told me the ridgeline in the near distance to the south was 40km long and took over a week to traverse it. Seeing this I felt a desire to return to Iran to climb other routes. We knew we were approaching the summit when the volcanic vents got ever closer. Soon we could smell their pungent odour, full of sulphur, and we couldn’t tell the difference between passing cumulus clouds and the volcanic ones. Eventually, after 10 long hours climbing steadily upwards, the summit was reached. We were above all of the vents and the whole of the Middle East. 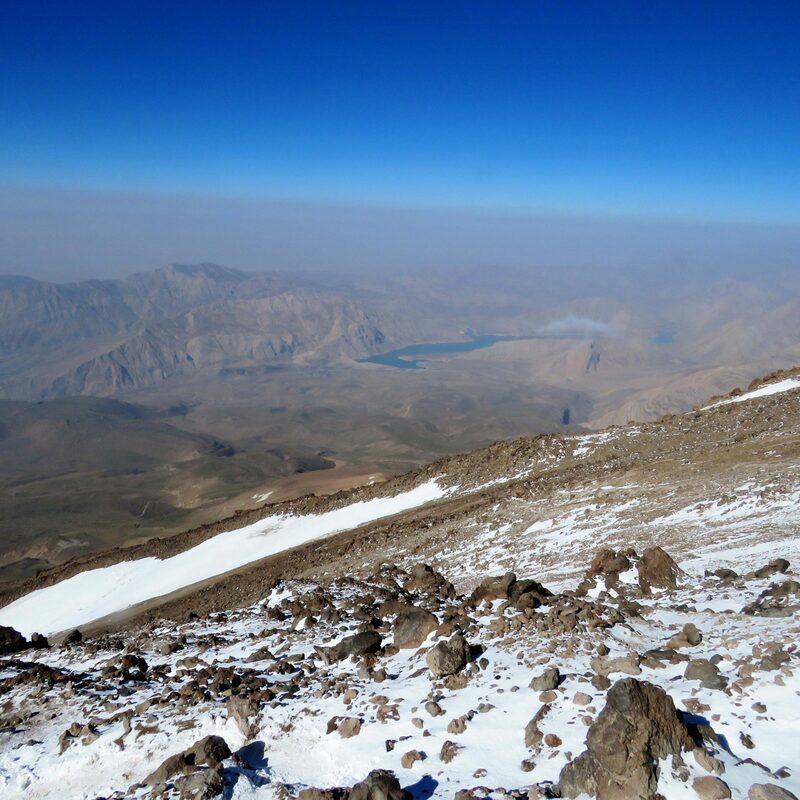 We had climbed to the top of Mt Damavand, however high it truly is. The descent to the hut took a 1/5th of the time of the ascent. We took large steps down the steep, snow-covered slopes. The accommodation was visible for nearly all of the route down and steadily grew in size until we returned safely inside and tucked into a hearty soup before heading on down to the trailhead and then driving to the village far below as night fell. It was the most exhilarating peak I have climbed in many years, a mountain of great beauty yet so accessible as a trekking peak. A wonderfully satisfying summit day I will never forget.